Most of us are far from that state of realization where every moment is vibrant with absolute mindfulness. But we are beginning to recognize the tremendous benefits of living mindfully through anecdotal evidence and mounting research. Of course the struggle is how to train the mind to slowly shift from the constant time travel (thinking about the past and worrying about the future) to residing in the present moment. Most mindfulness practices prescribe setting aside some quiet time to focus, and people find this challenging in their fast-paced lives. But what if mindfulness was applied to activities that we already do anyway. Eating is generally pleasurable for most people, but doing so in a mindful way can add so much more dimension to the experience. Paying attention to the smells and textures, savoring the complex tastes, and focusing on the body’s interaction with the meal adds a whole new layer of immersion with something as essential as food. Although there are formalized mindful eating practices that can be learned at a retreat, which are wonderful to practice but take a bit more time, let’s at least try to bring some casual mindful eating to our everyday meals. What might this mean? It might help to contrast mindful eating with mindless eating. Slow Down – Aside from an essential ingredient for being mindful, slowing down and biting smaller portions actually greatly assists the digestion process because food is prepped for the stomach by saliva. And did you know that the feeling of satiation comes on average 20 minutes after we’re actually full? That’s a big reason why people over-eat. Listen to Your Body – We often eat because our brain wants food… not because the body needs it but because of emotional signals like stress, depression, loneliness, or boredom. The foundation for mindful eating is to nourish the body, not feed emotions. The listening doesn’t stop there. A big part of the recipe is to listen to the senses as you savor the meal, bite by slow bite. Awareness in Eating – The environment and circumstances of eating in modern society has shifted from a dedicated and shared activity to one of multi-tasking, eating on the fly, or munching away in front of the TV. According to a 2011 report from the U.S. Department of Agriculture, the average American spends two-and-a-half hours a day eating, but more than half the time, we’re doing something else, too. Eating mindfully means the mind is 100% present on the whole process of eating. Eat to Your Benefit – Not just good advice for eating mindfully but for eating in general, the prescription is shifting to nutritionally beneficial foods, and shifting away from junk foods eaten compulsively. Food Lifecycle – Taking food for granted is the opposite of thinking about food mindfully. That includes not just the act of eating but the full lifecycle process, including mindful gratitude to what it took to get the food to the plate (actually eating mindfully really starts with your shopping list), but also what will happen after your eat it – how it turns into your body. Eating mindfully is not only a much healthier alternative for the body and mind, but it can also cherish family togetherness. Did you know there is even an organization for this movement? 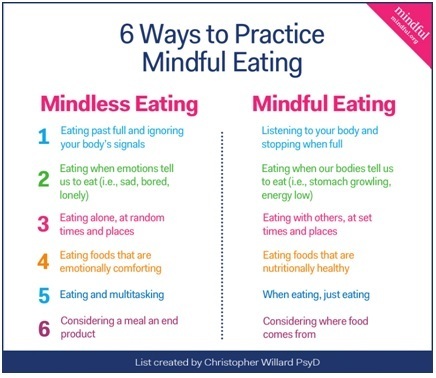 It’s called The Center for Mindful Eating, and one of the many resources it provided is a comprehensive reference list of research on the practice of mindful eating. Given that eating is an integral part of our lives, it only makes sense to bring mindfulness to the table. It’s a key step in our journey in raising our level of awareness in all aspects of life. Previous articleReady for Partner Yoga?